Anyway enough of all that lets get to the vegetable of the week! It took a long time for Maureen to acquire the taste for asparagus but since she has it has become difficult to stop her from having it with almost everything! The English asparagus season officially starts on 1st May, but depending on the weather can start as early as mid-April the harvest lasts for approximately 6 weeks, until mid-June. Although asparagus was once only grown in certain areas of the United Kingdom, for example the Vale of Evesham, East Anglia, Kent, and London, it is now grown in most regions of the United Kingdom. It’s a grand accompaniment to seasonal meats and fish, steam, grill or roast it, add it to tarts or blend it into soups no matter which way you cook it you are going to be in for a scrumptious treat. British asparagus, with its intense, complex flavour, is considered by the British, at least to be the finest in the world. Its deep, verdant flavour is attributed in large part to Britain’s cool growing conditions. Early records of asparagus crop growing trace it back to Greece some two thousand or so years ago. The Greeks understood that asparagus possessed medicinal properties and recommended it as a cure for toothaches. Asparagus contains more folic acid than any other vegetable, it is also a source of fibre, potassium, vitamins A and C and glutathione, a phytochemical with antioxidant and anticarcinogenic properties. In spite of what you may have read or heard, it’s not necessary to buy an asparagus steamer, nor to bind the asparagus into a bundle and cook it upright in a pan. There’s nowt like fresh fruit and vegetables in their season its when they are at their very best, that also goes for meat, fish and game, you get something so wonderful when eating food as soon as it’s just been picked, it tastes better, it’s better for your wallet and it’s a healthier deal for the planet. 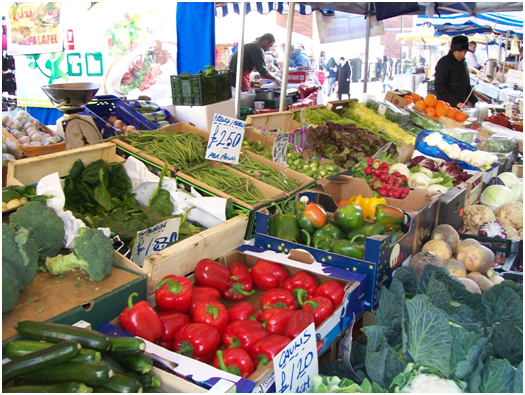 Food produced locally, whether you have bought from a farmers’ market, local butcher, greengrocer, or fishmonger; it is liable to be a lot fresher and tastier than its supermarket counterpart. Meat produced with high regard for the animals concerned, without the addition of growth hormones, permanent fabricated daylight, and all the other sleight of hand tricks the producers use, then in your heart you know that the dairy, meat, and fish you purchase from high-quality local traders in its proper season will without doubt be of a far better-quality. This is the start of our year even if it doesn’t feel like it, spring is almost here, in March, the weather starts to warm up (or so it should be doing), the time from now until about the middle of May is a tricky one for the shopper, grower, and greengrocer alike, winter vegetables are fading out whereas the spring veggies haven’t so far really got under way, however there is plenty of purple sprouting broccoli around so make use of it. The beginning of the purple sprouting broccoli season brings and gives us a much sought after addition to the winter vegetable enjoyment. 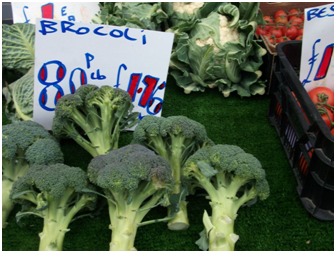 Simply steamed or boiled, this vivacious cousin of broccoli can be used in the same way, it is leafier and deeper in colour than broccoli; it always adds vitality and crunch to vegetable dishes and it goes well with almost any fish or meat dish. Broccoli is a cruciferous plant, from the same genus as the cabbage, and is associated to the cauliflower; cruciferous foods are nowadays hailed as having a number of significant health benefits. 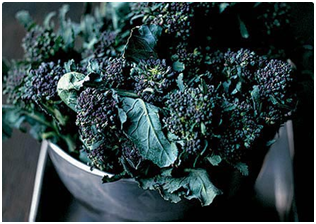 Purple Sprouting Broccoli contains the phytochemical sulphoraphane, which is thought to help prevent cancer. Furthermore it could provide resistance against heart disease, osteoporosis, and diabetes. It is packed with vitamin C and is a good source of caretenoids, iron, folic acid, calcium, fibre, and vitamin A. Did I mention that it tastes great just simply steamed and served with melted butter and a squeeze of lemon juice? As with the British asparagus season, the Jersey Royals season and the first of the British artichokes we always look forward to the first of the purple sprouting broccoli, in our opinion events like these are what makes British seasonal produce the finest in the world. March sees the first of British rhubarb, and it is superb, but we are now seeing the last of our British apples and although we are still getting pears pretty soon they will be coming from further away. Citrus fruits are making their way from Spain and Sicily and there are of course lots of fruits around that do and have to come from far away, its just a matter of picking carefully where the fruit you choose does come from. In the spring month of March (yes it’s a spring month), Saint David’s day proclaims the month of March, and with St Patrick’s Day on the 17th, now is the time to think what we can be doing with all those tasty expected spring veggies, Lincolnshire starts to harvest carrots, beetroot, purple sprouting broccoli and calabrese broccoli as do other regions of Britain, so make the most from the first bloom. We are seeing more and more spring vegetables in the markets and some supermarkets, so with excited expectation our thoughts are turning to lighter dishes as we see Chicory, Chives, Mint, Parsley, Radishes, Rosemary, Sorrel, Spring Greens, Thyme, and Watercress coming into their season, and Cornish Spring greens are also becoming more plentiful and are very tasty, jam packed full of flavour and sweetness, the two biggest enemies of cabbage are water and overcooking, the one thing you don’t want to do is boil it to death in a large saucepan of water. Simply remove any damaged outer leaves, cut it in quarters, removing the tough white ‘core’ in the middle, and slice it finely then you can either stir-fry it in a wok with oil, a little water and soy sauce or tip it into a saucepan with about 3 cm of boiling water and cook it fast for about 3 minutes, turning it over as you go. Drain it thoroughly, add a good chunk of butter, and season with salt and plenty of freshly ground white pepper. A small to medium size cabbage will easily serve 4. Leeks are fantastic in early spring, and we like to use them, not only as vegetables to go together with poultry, meat and fish, but in soups, salads and tarts for first courses, we also like to lightly braise baby leeks as a lovely light side dish. Don’t be afraid to buy them loose and covered with dirt the taste is much better than ones that have been washed and pre-packed. Just cut off the top half of the green leaves and remove the root and any damaged outer leaves, cut vertically down the leek almost to the base and wash thoroughly between the leaves with cold running water slice the leeks thickly and wash again then cook in a little butter and oil. They also make superb soups and we think they are very good in egg and cheese dishes. New season artichokes from Italy, Cyprus, and Egypt are making their first appearance on the shelves, together with the first of the tomatoes with taste from Sicily and the black volcanic soil of Tenerife and Fuerteventura. Fast on their heels will be new potatoes from around the Mediterranean, asparagus (we had some superb asparagus from John Bussey’s Stall at the weekend) from the Murcia and Valencia provinces in Spain, and strawberries from Huelva in Andalucia. Beetroot, Brussels Sprouts, Carrots, Cauliflower, Celeriac, Celery, Chicory, Horseradish, Jerusalem Artichoke, Kale, Kohlrabi, Leeks, Onions, Parsnips, Potatoes (new), Purple Sprouting Broccoli, Radishes, Rhubarb, Rocket, Salsify, Shallots, Spinach, Spring Greens, Swede and Turnips. There are lots of herbs available including growing pots of herbs alas not all from the UK but in the main they are all good and from quite close. I do have one gripe though we grow some wonderful parsley in the UK and English parsley is available now so could someone please tell me why the big supermarkets are selling parsley frown in Turkey? Beef, Chicken, Duck, and Pork are all very good and we are eagerly waiting for the first of British Spring Lamb, make the most of Rabbit this month wild rabbit meat, which is leaner and tastier than the farmed kind, has a wonderful delicate, gamey taste, very different from splendidly flavoured hare. Local Rabbit dishes reveal the fact that rabbit is very flexible and works well with those flavours used in chicken dishes, such as mustard and cream, tomato and herbs, and believe it or not chilli, I have had some superb rabbit dishes in Mexico. Turkey, Venison, and Wood Pigeon are still good. Spring has sprung (sorry, couldn’t help that) and we are seeing a breath-taking range of seafood landed from around the Cornish coast, the one (and only) awful feature about the appearance of spring is that our beloved native mussels are off the seasonal menu until September we still have the rope grown imported mussels but they are not quite the same so, fill up on these juicy morsels while you can native oysters are now becoming more difficult to find and will soon be out of season however the pacific or rock oyster will always be a good substitute (just about) as they offer smaller portions with a more subtle taste. Unusually the fishermen are still landing loads of mackerel and the season may go year round, large cod and Pollack are excellent at the moment we had some Pollack from Jon last week and it was fat, juicy, and sweet. We would also recommend the lemon sole, and what with the quite good Cornish lobster catches at the moment prices have been reduced, so now is the time to get lobster for that special meal. With Mother’s Day approaching why not make your Mum, wife or girlfriend a really special seafood dish? 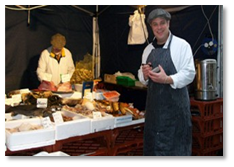 Brill, Clams, Cockles, Cod, Conger Eel, Crab, Dabs, Dover Sole, Eel, Elvers, Haddock, Halibut, Hake, John Dory, Langoustine, Lemon Sole, Lobster, Mackerel, Monkfish, Plaice, Pollack, Scottish Wild Salmon is back in season, Sardines, Scallops, Sea Bream, Sea Trout, Skate, Squid, Turbot, Whitebait, and Winkles. Aldi has launched a new recruitment website for suppliers as it looks to boost the amount of British produce it offers in stores. The website (www.aldisuppliers.co.uk) provides information about Aldi’s long term relationships with existing British suppliers and provides potential suppliers with an online form to complete. Did you know…. about 48% of Aldi food is British and 100% of their fresh meat is British! Asda is trial running gurnard fish fillets from the South West in over 100 of its stores in the wake of Hugh’s Fish Fight and in order to make the most of under-utilised species from the UK. Gurnard is a firm fleshed fish with a mild flavour. Sainsbury’s has announced it is the UK’s first supermarket to use cage-free eggs in all of its own-label products. But it’s not all good news on the egg front! After the battery egg ban came into force on 1st January, supermarkets are now concerned that food producers will not be able to afford the cost of ethical eggs in coming months. The ban has led to a shortage of both liquid and powered egg and therefore producers are seeing an increase in price. For example, a traditional ice cream manufacturer in Kent has been informed that the price he pays for egg yolk will rise by 70 per cent. Morrisons is holding its first music and food festival at Harewood House, Leeds in July. MFest will feature X Factor winner Matt Cardle and TV chefs Aldo Zilli, Nigel Haworth, and Bryn Williams will all run cookery master classes for the event. The first early crop of English asparagus arrived this month in Budgens stores – well before its usual mid-April and June season. The asparagus was produced as part of an English glass house crop from IVG White, part of Keelings Group with growers in Worcestershire and Cambridgeshire. BPEX has published a ‘Baconologist’ Guide to bacon, giving a handy insight into the many cures and types of bacon and their suitability to different dishes. The Guide has been published to coincide with Bacon Connoisseurs Week (19 – 25 March). See http://www.lovepork.co.uk for more details. The UK has become a net exporter of lamb for the first time in 50 years. The figures from 2011 show that sheep meat exports from the UK increased by 11 per cent, while imports fell 13 per cent during the same period. Black Pudding is making a comeback! Through a combination of celebrity chef endorsement and economic austerity, the ‘blood sausage’ is enjoying a sales boom with some producers claiming a 25 per cent sales increase over the past year. Pig industry and retailer representatives have refused to back down in the row over pig industry profitability. 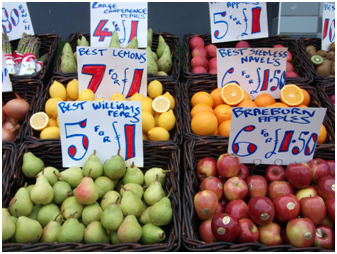 BPEX has criticised supermarkets for boosting profitability by increasing own-label ranges which can be sourced at lower input prices. BPEX says it is the moral responsibility of supermarkets to pursue a sustainable supply chain rather than short term profits. In response, a spokesperson for the British Retail Consortium has hit back stating that supermarkets are dedicated to a sustainable supply chain and pointing out that retailers are not the only destination for UK pork; food manufacturing, catering and government procurement are also important buyers, yet these seem to all escape public scrutiny. The chairman of English Apples and Pears is calling for more Cameo apple growers in the UK. The chairman states ‘we have got a good proportion of the multiples stocking Cameo, and there’s potential to go wider, but we need to persuade people to grow. 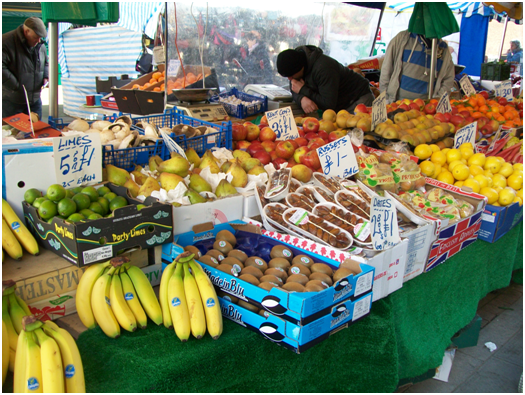 We don’t have the sufficient growers to supply the market for as long as we would like’. Northern Ireland fresh vegetable packer, Sparky Pac, has launched a new brand focusing exclusively on local produce. Dig In features carrots, parsnips, Savoy cabbages, caulis and sweetheart cabbage but the brand will only be available on shop shelves when produce is in season. Dig In will not be available at any other times. Finally, it has been revealed that of Britain’s 150 Biggest Grocery Brands, just 44 are now UK-owned. Of the 91 brands in the list that were created and developed in the UK, only 36 are British owned today. Vegetables: beetroot, broccoli, Brussels sprouts, cauliflower, carrots, cauliflower, celeriac, chicory, cucumber, jersey royal new potatoes, Jerusalem artichoke, kale, kohlrabi, leeks, onions, parsnips, potatoes (main crop), purple sprouting broccoli, rhubarb, rocket, salsify, shallots, spinach, spring onions and swede. Herbs: chives, coriander, dill, mushrooms (cultivated), parsley (curly), sorrel and wild nettles. 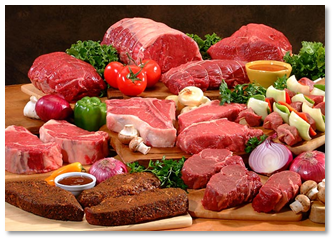 Meat: beef, chicken, pork, rabbit, turkey, and wood pigeon. 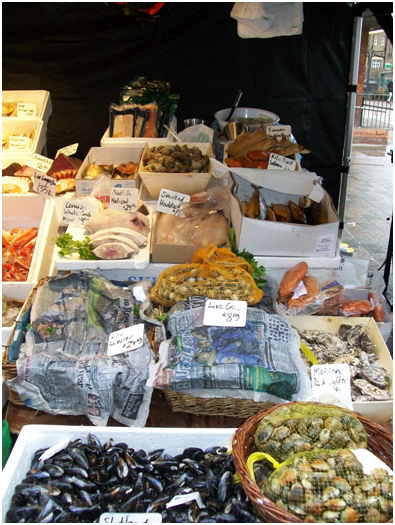 Fish: cockles, crab, dab, dover sole, hake, john dory, lemon sole, lobster, mackerel, mussels, oysters, prawns, salmon, scallops, sea trout, shrimp, skate, whitebait and winkles. 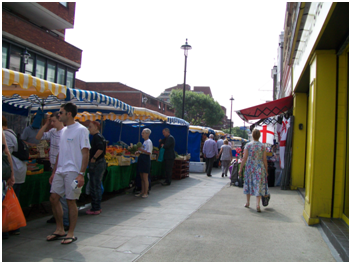 27th July 12th August 2012, Love British Food 2012. Get ready to fly the union jack on plates as well as on your bunting! 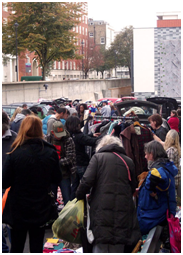 Oh if you like the carboot on Facebook entry for buyers is free of charge. They only buy British produce on John Bussey’s stall when possible and in season, the family have had a stall on the market for 80 years now and they believe very strongly in supplying the best quality produce that is in season and at its best, they always seem to be the first to obtain the great British produce such as jersey royal potatoes, British asparagus, British soft fruits, when visiting look out for good sprouts, cauliflowers, leeks and cox’s apples; English berries and lettuce are available in season. John’s stall was a picture it is wonderful to see such fresh produce full of energetic colours, especially the Rhubarb it really looked so vibrant and cooked up a treat when we made one of our favourite puddings, Maureen bought some blood oranges for me, they came from Sicily so not too far away and they were delicious, we also tried the asparagus and found it to be so full of flavour we could have sworn it was British, so what else was on offer? Well there was Apples English Braeburns and Bramleys, Artichokes, Beets, English Broccoli, Butternut Squash, Cabbage, Cauliflower, Courgettes, English King Edward Potatoes, Fennel, Field Mushrooms, Leeks, Mache (Lambs Lettuce), Parsnips, Purple Sprouting Broccoli, Radish, Watercress, you can plainly see that all of what was available was in first-rate condition. Following a somewhat skeletal couple of months on the leafy vegetable front, the commencement of the purple sprouting broccoli season heralds a much wanted addition to the winter vegetable enjoyment. Merely steamed or boiled, this lively cousin of broccoli can be used in the same way. It is leafier and deeper in colour than Calabrese; it always adds vitality and crunch to vegetable dishes and it goes well with almost any fish or meat dish. As with the British asparagus season, the Jersey Royals season and the first of the British Artichokes we always look forward to the first of the purple sprouting broccoli, in our opinion events like these are what makes British seasonal produce the finest in the world. Purple sprouting broccoli was originally grown by the Romans; Broccoli has been grown in the United Kingdom since the 18th century, even though the purple sprouting type has only risen to celebrity in the last 20 years. Purple Sprouting Broccoli is outstandingly tasty when young and tender, look out for darkly coloured heads/spears with crunchy stalks, and no more than 1cm in diameter, which snap cleanly when broken always pass up easily bent broccoli. Split thicker stalks about halfway up so that they cook at the same time as the heads/spears. Steam, stir-fry or boil in a small amount of water, the tasty leaves are edible and so do not need to be removed. We like it just boiled in salted water, drained, and served warm with melted butter and lemon juice. John Freeman owner of Freemans butchers supplies high quality meat to the local residents of Pimlico and Westminster indeed people travel from all over London to purchase their meat from this traditional high street butcher. He says that they are passionate about their product and are committed to ensuring quality meat at the best possible price; we aim for excellence with the right product, right price, and right quality 100% of the time he told me. Beef, lamb, and pork is good this month and our local butcher Freemans has some ox-tails and beef brisket in that is just so tasty his fore-rib of beef looked just about perfectly hung and at under £14 per kilo is probably the cheapest in London you really must give the classically trained butcher a go and just to see a real traditional butcher shop is a treat. I just love the flavour and versatility of rabbit wild or farmed although wild rabbit meat is leaner and tastier than the farmed kind, has a wonderful delicate, gamey taste, so much different from a superbly flavoured hare. So often overlooked as a dinner option, which is a shame as I have said the meat is lean yet tasty especially wild rabbit, which has a superb tantalizing, gamey flavour, and this understated flavour gives itself to a range of cooking techniques. 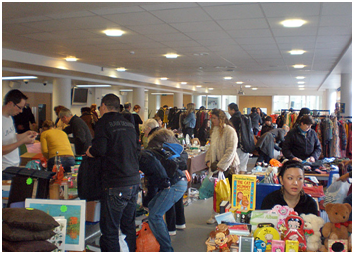 Rabbit is available all year round in the UK Available all year round. Butchers are more likely to sell rabbit than supermarkets; try to avoid anything in excess of a kilo, as it can prove tough. 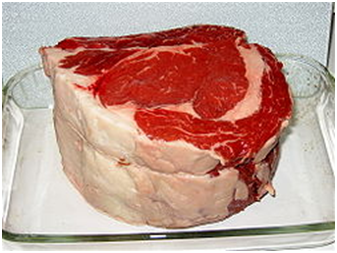 The type of meat you can buy varies: ‘fryer’ is the leanest and tenderest; ‘roaster’, is a more mature rabbit, at its best when given a longer cooking time; last but not least there are the giblets, which are the organs of the animal. Take care when cooking rabbit, as the low fat content can make it dry if it’s not marinated beforehand, or basted during cooking. Regional dishes from around the world show the fact that rabbit is very flexible and works well with those flavours used in chicken dishes, such as mustard and cream, tomato and herbs, and believe it or not chilli, I have had some superb rabbit dishes in Mexico. Get hold of some rabbit and try one of the great classic recipes such as Braised Rabbit and Roast Rabbit with Rosemary or the recipe below although it isn’t one of mine it is a superb recipe and just the thing if this is your first time cooking rabbit. Unlike a lot of Europe, rabbit is hardly ever seen in UK supermarkets although rabbit is back on the dinner table as sales of the game meat soar after being endorsed by celebrity chefs such as Nigella Lawson and Nigel Slater. And is becoming more commonly obtainable in butchers, supermarkets, try Waitrose for their excellent rabbit, and food markets. It is also available by mail order from a number of suppliers, such as Woldsway Foods Ltd or the Wild Meat Company. Select rabbits by size; they should be large enough to produce a sizeable amount of meat, wild rabbits larger than 1 kilo are liable to be tough, the younger, smaller rabbits will be more tender and suitable to faster cooking methods, for example roasting or barbecuing older rabbits will have more taste but can tougher so its better use these for braising, casseroling and in pies..
Fresh rabbit will keep in the fridge for several days (or longer if vacuum packed). I wouldn’t freeze rabbit as freezing can dry them out. 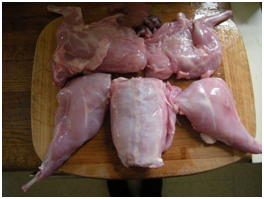 To joint a rabbit, cut the hind quarters away from the body and separate the legs, halve the leg joints and cut the body (saddle) straight through the backbone into two or three portions, stopping at the rib cage, cut lengthways through the breastbone and divide the ribcage section in half. As rabbit meat is very lean, care should be taken to prevent it from drying out during cooking, marinating or barding (covering in a fat or wrapping in bacon) can help moisten the flesh during roasting or barbecuing. 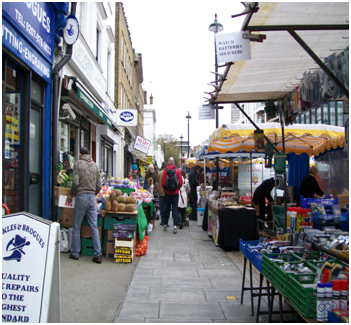 Strolling through our local market on Tachbrook Street, SW1 you will probably see that our favourite fishmonger Jonathan Norris has on display (and what a display) all you might ever want from your fishmonger for sale at a extremely affordable prices as well as other fish and shellfish that you don’t normally see on a market stall and furthermore you will see that the fish is caught from around the UK’s own shores with Scotland and Cornwall dominant. Jon is so friendly and a real character and when you speak to him you notice at once that he’s enthusiastic about all things fish, and when you ask him about the fish he has available you become aware that from his response that there’s nothing he and his staff don’t know about the produce they sell. Most all Jon’s fish is from around the Cornish, Devon, and Scottish coasts and we are still recommending the crab, mussels, whiting, and Pollack. Jon put on show as usual with Cornish Brill, Clams including Razor Clams, Cod fillets, Cod steaks, Crab, Haddock, Cornish Hake, Halibut, John Dory, Lemon Sole, Megrim Sole, Dover Sole, Gilthead Bream, Cornish Gurnard, grey Mullet, Lobster, Scottish Mackerel, rope grown Mussels from the Shetland Isles, Monkfish, Cornish Octopus, there was Plaice from Scotland so plump and sweet, Prawns in the shell, there were Native Oysters, Rock Oysters, Scallops from the Isle of Man, wild Sea Bass, Skate, Sprats, Squid, Turbot, and Cornish Whiting. Prices are so reasonable you have got to give this gifted and extraordinary fishmonger a try, you won’t be sorry, I promise. Catches of Northern hake, landed around the UK, are looking plentiful this season – so Seafish, the authority on seafood, is urging consumers to try this excellent whitefish. Hake, known as ‘Merluza’ in Spain, is a Spanish favourite and since the Spanish have the highest per capita consumption of seafood in Europe, they should know what they’re talking about. Hake used to be a familiar fish to Britons but seems to have fallen from favour at a time when availability is very good. We only spent £1.5 million on chilled hake in supermarkets in the past year, compared to £124 million on chilled cod (Nielsen retail figures for 52 weeks leading up to 16 April 2011). At its best from March to September, finer white flesh than cod and a much superior flavour, cook like cod. Hake is an under-rated fish, which is a shame because it has a subtle and delicious flavour, similar to cod. Best of all, it is environmentally sustainable, yet inexpensive. It is also easy to prepare as it has relatively few bones. The numerous fish that come under the designation ‘Hake’ are deep-sea members of the cod family and are popular throughout Europe especially Spain and Portugal also very popular in America. Hake is quite a mild flavoured fish, with a white flaky texture and a finer taste that is more subtle than that of its larger cousin the cod. They are fished by bottom trawling with different mesh sizes for inshore and deep-water trawls. Ranging from 1kg to 5 kg and Hake has a soft, iron-grey skin and silvery belly. 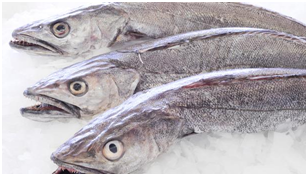 Also known as Cape Hake it is a sustainable fishery, as certified by the Marine Stewardship Council. Many varieties of hake are caught in waters around the world, particularly in the Atlantic and North Pacific. It’s available both fresh and frozen, and is sold either as a whole fish, or gutted with the head intact, or as fillets and steaks. 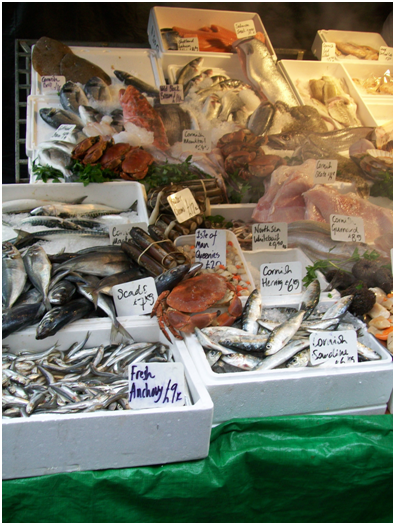 Some varieties of hake have been greatly affected by over fishing. A lot of hake is now imported from South Africa. Look for glistening pure white flesh that is free of signs of dryness, greyness, and browning. It should have a seawater fresh scent. Hake is a mildly flavoured fish. The flesh is quite soft, but firms up on cooking, and is worth trying. 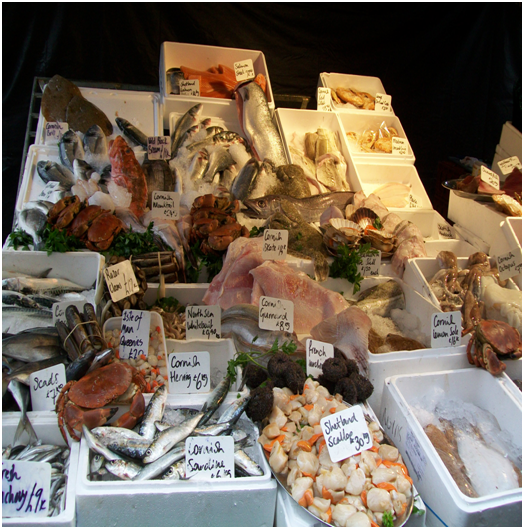 In France, hake is called ‘Saumon Blanc’ (which interprets as ‘white salmon’). Fillets require little preparation as the skin is soft, but checking for bones and pin-bones is necessary. It is popular in Spain and Portugal where it’s grilled, pan-fried, and baked. It takes robust flavours well, particularly tomatoes, garlic, chorizo, and paprika. For a light, modern alternative to battered cod, try deep-frying hake fillets dipped in a light tempura batter. Fishermen from the provinces on the Bay of Biscay, especially the Basques, introduced this fish into Spanish gastronomy, as for example, hake in potato casserole (Galician style). Coated with flour, it can be cooked in a pan with a little olive oil and served with a green sauce with some clams, or poached in cider with tomatoes and green onions. Well we just might be able to get some salads, herbs, and some tomatoes in this year, they are making a start on our new windows at the beginning of April, and with a bit of luck ours should be done by May (hopefully). Fancy giving cod a rest and trying a different fish for a change? This is a very popular recipe in Spain its quick and easy and just right for a light lunch or supper. Mix together the seasoned flour, lemon zest and parsley, pat onto the fish on both sides well, shaking off any excess. Heat the oil in a large frying pan over a moderate heat; cook the fish for 11 to 12 minutes turning occasionally. Drain on kitchen paper and serve with lemon wedges and seasonal vegetables. In the last few years, I have noticed what the chef’s are calling a return to the grass roots of British cuisine and seeing that a lot of mutton dishes abound I thought I would just add this one. I first came across it about 1969 when we had it on the menu at the Aspinall Arms at Mitton we only served it from about November until the spring lamb started coming in about March or April. Combine the mutton, garlic, rosemary, thyme, rowan or redcurrant jelly, and wine to make the marinade. Place the mutton in the marinade and turn the mutton over and over to coat evenly. Cover and place in the fridge for at least 6 hours but better still overnight. Heat the oven to 150c, 300f, gas mark 3. Remove the mutton from the marinade and reserve the marinade, dry the mutton off with some kitchen paper. Then heat the oil in Dutch oven or heavy casserole over a medium heat add the mutton and cook until sealed, browned and well caramelised all over. Remove from the pan and add the bacon and onions and cook, stirring until golden, takes about 5 minutes. Stir in the flour and add the marinade and stock. Return the mutton to the pan and cover, put into the oven to cook for 45 minutes. Add the potatoes and carrots cover, and return to the oven and cook for 1 hour or until potatoes are tender. Remove the mutton and vegetables to a warmed dish and cover with foil to keep warm. Bring the pan juices to a boil and boil until reduced and thickened slightly add Sea salt and freshly cracked black pepper to taste. To serve carve the mutton into nice thick slices and surround with vegetables, pour over the sauce and serve. Serve and Enjoy! It’s sad that still we struggle for the most part in vain to find mutton in butcher’s shops and supermarkets; maybe we should start a campaign? What is the difference between mutton and lamb well mutton has a more intense, richer and has more depth of flavour than lamb and requires longer cooking times. 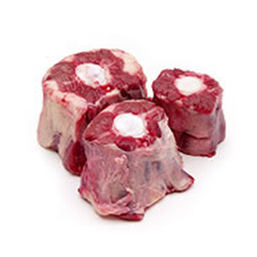 It is extraordinarily well suited to roasting, stewing and braising although mutton can be available all year, the best meat is produced from October to March. This is because the sheep have access to nutritious summer and autumn grass and heather, and are able to put on fat before being slaughtered. Hebridean, Herdwick, Romney, Shetland, Southdown, and Welsh Mountain are just some breeds of sheep with an historical reputation for producing delicious mutton. One of my particular favourite meals the cognac, mushrooms, and leek add an elegant touch to the usual chicken breasts. And also at all times it went down a treat for the mid-week evening meals at Wilton Lodge and Norwood West, apart from for Lord H of course he couldn’t eat the leek although he liked the flavour I just used to serve it to him without the leek. Heat 1½ teaspoons oil in a large frying pan over a medium to high heat, add the chicken, and sear until well browned on both sides, about 3 minutes per side. Remove the chicken to a plate, cover, and keep warm. Reduce the heat to medium, add the remaining 1½ teaspoons of oil to the pan, and then add the leek and thyme. Cook, stirring, for 2 minutes, and add the mushrooms cook for a further 5 minutes before adding the cognac let the cognac flame if you want to show off a little and then cook for about 2 minutes more. Transfer to a bowl, whisk the stock and flour in a small bowl, add to the pan and cook, whisking, until slightly thickened, about 3 minutes. Return the mushroom mixture, chicken and any collected juices to the pan, reduce the heat to low and simmer until the chicken is cooked through, about 4 minutes. Transfer the chicken to a warmed platter, season the sauce with salt, pepper and lemon juice to taste, spoon over the chicken garnish with parsley and Serve and Enjoy! I remember having this dish many, many years ago at a friend’s house and then in 1972 in the little fishing villages of Cala Bona and Calla Millor (not so small now though) on the island of Mallorca we had it again and again. This recipe is as original as it gets, modern versions differ somewhat but we like this better especially in June when we serve it with steamed Jersey Royal Potatoes. Chop the onion, carrot, and parsley and fry gently in a saucepan in oil, without browning. Add the peas and the hake, season, add the stock, and simmer for 30 minutes; put the asparagus tips in at the last moment, just to heat through. 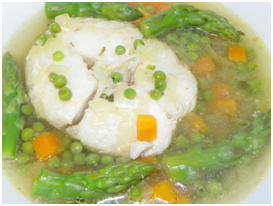 Serve the hake surrounded by the peas, with the asparagus tips on top and Enjoy! Our Favourite month and not just because of what is in season and available on the 14th of this month we will have been married for 38 years yes 38 years and is really doesn’t feel like it, here is a photo of us on that day just before we left for Mallorca. Now June is here and the sun is warm, our thoughts turn to lighter foods, picnics and barbeques, and out comes the salad bowl, do you think that there is anything better than fresh summer produce? Biting into a sweet strawberry or munching your way through a bag of glistening red cherries is as much a part of a British summer as sunburn and short shorts. 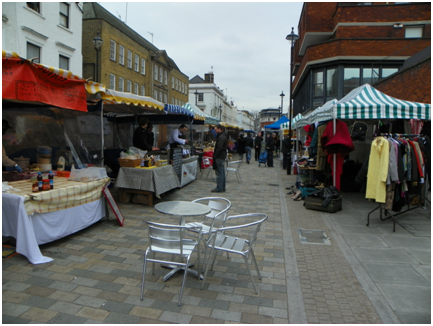 This month our own British foodstuffs really begin to emerge, soft fruits, vegetables and seafood are abundant the asparagus is still good and the Jersey Royals are still as tasty as ever. The wealth of June is just what we’ve been waiting for, the days grow longer, and it’s a joy to go shopping with the markets, shops, and supermarkets just overrunning with the best of British produce especially The first of the Kentish fruit so we say welcome to the strawberries and gooseberries and now’s the time to make the most of the young broad beans, peas and new potatoes, to be enjoyed with new season lamb and don’t forget June is also a good month for quail, beef and guinea fowl and there is lots of fish in season, including mackerel, plaice and lemon sole. Look out for the fish and shellfish from Scottish and Western waters especially lobster and crab, monkfish is at its best, Salmon is relatively cheap right now and sardines are terrific just grilled with a little seasoning and lemon. 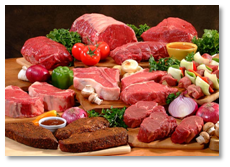 Most butchers will by now supplying you with barbeque packs of meats, but beware there are a few unscrupulous butchers who just use the barbeque season as an excuse to get rid of inferior meat. It’s time to fill your basket with herbs and tender young veggies our diminutive balcony garden is now giving us a steady supply of Rocket, Baby Salad Leaves, Mint and Parsley. Summer is beckoning us June asks us to luxuriate in the sumptuous range of produce it has to offer, Strawberries are reaching their best, with the earliest varieties from Hampshire and the Cheddar gorge available in the first couple of weeks and by the end of the month the strawberries from Kent will be in full flow and the prices will plummet. Apricots, cherries, and gooseberries are worth looking out for. Herbs: Basil, Chervil, Chives, Dill, Elderflower, Mint, Nasturtium, Parsley (Curly), Parsley (Flat-Leaf), Rosemary, Sorrel, Tarragon, and Thyme. Line-Caught Mackerel are getting bigger and it’s definitely the time to be eating flat fish, Lemon Sole and Plaice are especially succulent and plentiful at the moment. Cod, Crab, Haddock, Herring, John Dory, Lemon Sole, Lobster, Mackerel, Plaice, Pollack, Prawns, Salmon, Sardines, Sea Bream, Sea Trout, Shrimp, Whelks, and Whitebait. Nigel Haworth is returning for a second year to host a two day foodie’s extravaganza. The Fantastic Food Show promises to be an example of real northern hospitality, which means you’ll be leaving with a smile on your face! The Cookery Theatre is the place to go to pick up handy tips with the likes of Simon Rimmer and Nigel himself showing what they’re made of. 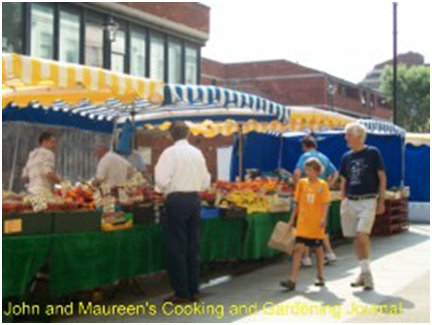 There are plenty of local producers keen to answer your questions and show off what they’ve got, so if the cupboard are looking a bit bare, this is a great place to stock up. 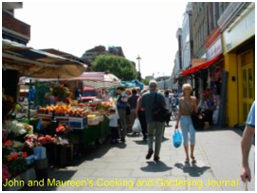 16 – 19 June, Taste of London, Regent’s Park, London. Right in the heart of the capital, some of the country’s best chefs and produce come together in a food fest that will tickle the taste buds and get the creative juices running. You will have the unique opportunity to dine from 40 of London’s top restaurants, try and buy from 200 top quality foods and drink producers and see the pros demonstrate their skills live on stage. 2011 will see the addition of ‘The Secret Garden’, an exclusive area where visitors will have the chance to take part in Q&A sessions with chefs while feasting on canapés and champagne. 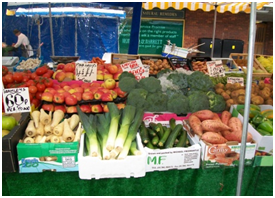 Asparagus, broad beans, carrots, cauliflower, lettuce, new potatoes, peas, radishes, rocket, sorrel, spring onions, watercress along with the most tasty fruits such as Cherries, elderflowers, gooseberries, redcurrants, rhubarb, strawberries, and Raspberries. Beef, Guinea Fowl, Lamb, Pork, Rabbit, Veal, Quail, and Wood Pigeon. Another great display from Jon including a small shark, to day he was showing amongst others live Crab, South coast Flounder, Cornish Octopus, Cornish Haddock, Cornish Hake, Hake is an under-rated fish, which is a shame because it has a subtle and delicious flavour, similar to cod. Best of all, it is environmentally sustainable, yet inexpensive. It is also easy to prepare as it has relatively few bones. Heating the fish fillets slowly in a cold pan prevents them from curling up during frying. This works really well for firm fish with thin skins, such as hake. There was also wild Scottish Sea Trout, Cornish Dover Sole, Scottish Squid, Scottish Langoustines, Halibut, Herring, Lemon Sole, line caught Mackerel, Plaice, Pollack, Sea Bass, and Cornish Turbot as you will all know by now most all Jon’s fish is from around the Cornish, Devon and Scottish coasts, just look at the photos and see just how passionate Jon and his family and friends are about the produce they sell, oh we’re also recommending Jon’s Dressed Crab it’s a simple, healthy meal using a mixture of brown and white Crab meat and prawns so delicious with salad and a light dressing. 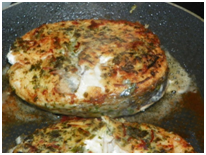 We bought some Hake from Jon as it is a while since we had some and his looked very fresh and tasty, here are two of my favourite recipes for Hake. Chop the onion, carrot, and parsley and fry gently in a saucepan in oil, without browning. Add the peas and the hake, season, add the stock and simmer for 30 minutes; put the asparagus tips in at the last moment, just to heat through. Mix together the seasoned flour, lemon zest and parsley, pat onto the fish on both sides well, shaking off any excess. Heat the oil in a large frying pan over a moderate heat; cook the fish for 11 to 12 minutes turning occasionally. Drain on kitchen paper and serve with lemon wedges and seasonal vegetables. This exquisite, classic dish isn’t as rich and fattening as it sounds and it is terrifically yummy, we get our guinea fowl from Sainsbury’s when they have them on special offer at less than £5 per bird. Waitrose also have some very nice guinea fowl on their meat counter, more expensive but theirs is free range from the Loire valley. Your local butcher should be able to get guinea fowl for you and there are lots of on-line suppliers of game birds. This was always a popular item on the menu at the Great Tree Hotel we used to get our Guinea fowl from a local supplier and my young chefs were always please that he always brought them to us dressed, I suppose all young commis chefs dislike the job of dressing birds I know I did. In later years Lord Hanson, Nigel Lawson and William Waldegrave, and many others also liked this dish. Preheat oven to 400°F/200°C/Gasmark 6. Wash and dry the guinea fowl, then rub well with salt and pepper, brown quickly in oil in a flameproof casserole, and remove from the pan and pour off all but 1 tablespoon of the oil. Put the walnuts and thyme into the pan and fry, stirring, for 1 minute before slowly adding the cider, soured cream, and Calvados, you can let the calvados flame its only the alcohol that burns off. Lay the guinea fowl in the sauce, covering the breasts with 1 bacon rasher each, cover, and put in the oven for 45 minutes. Peel, core and slice the apples, melt the butter, and fry the apple slices gently for 10 minutes, then sprinkle with sugar. Brown the guinea fowl on a oven tray in the oven for 10 minutes, and reduce the sauce, cut the guinea fowl in halves (we always remove the breastbone, back bone), serve with the sauce, garnished with apple slices and enjoy! The domestic Guinea Fowl is still found in the wild where it forages in large flocks and is considered a fine game bird. It is mainly kept for food, as its eggs and meat are very good to eat. Sometimes called Pintade, Guinea Fowl are a family of birds originating from Africa, related to other game birds such as the pheasants, turkeys and partridges, and having a long history of domestication, mainly involving the Helmeted Guinea fowl? Here in the UK, they were usually known as "Gleanies” the young (called "keets") are very small at birth and are kept in a brooder box inside the house until about six weeks of age, before being moved into a proper coop or enclosure the cooked flesh of guinea fowl resembles chicken in texture, with a flavour somewhere between chicken and turkey it makes a great alternative to chicken for a warming dinner on an autumn night, with a lovely flavour that is slightly gamey but very subtle much less gamier than pheasant or grouse, it can be magnificent when cooked simply. Guinea fowl meat is high in protein and low in cholesterol. It is a good source of vitamin B6, selenium, and niacin. Guinea fowl are an important food throughout much of Africa, south of the Sahara, and are found in every region of the world. France, Belgium, and Italy are amongst the largest producers in Europe they are hardy birds that forage for food and so are often farmed in free range or semi wild facilities where they perform a valuable pest control function. They have an acute awareness of predators and so are valued for their role as a ‘watchdog’, alerting farmers to any henhouse intrusions. It is reported that they have the ability to distinguish between farmers’ family members and strangers. Look for free-range guinea fowl, rather than the intensively reared birds, many butchers sell free-range guinea fowl imported from France and if you ever see them the eggs are excellent and worth buying. Barding or regular basting is prudent when roasting guinea fowl, legs and wings are also excellent if marinated for a few hours before grilling. Keep Christmas straightforward this year, with this timeless recipe a succulent golden roasted turkey with all the trimmings. We just find it irresistible at anytime a moist, tender roast turkey and this recipe is the one I have used since I began roasting turkeys professionally way back in about 1968. At The Whitewell Hotel on the 2 weeks run up to Christmas we used to roast 2 to 3 turkeys a day and probably 6 on Christmas day at the Willow Tree restaurant we roasted 6 to 7 each day for the first 3 weeks of December and always had a perfect roast turkey with a golden crispy skin moist tender meat which was very flavoursome. Remove the turkey from the fridge 2 to 3 hours before you want to cook it, and allow it to reach room temperature. Rinse the turkey under cold water, and then pat dry with kitchen towel, season inside the turkey with a little sea salt and freshly ground black pepper, then put in the lemon quarters. Grease the tin with some of the goose fat, then place the onions and herb sprigs over the bottom, place the turkey on top, then rub the bird with the remaining goose fat and season with sea salt. Cover the breast of the turkey with foil and cook in the oven for the calculated cooking time, occasionally basting with the juices. About half an hour before the end of the cooking time, remove the foil and return the turkey to the oven to brown the skin. At this time make the stock for the gravy by boiling the giblets, neck, vegetables, and bouquet garni. Check that the turkey is cooked through by pushing a skewer into the thickest parts of the thighs if the juices are still pink and not clear, return to the oven for a further 15 minutes before testing again. Remove the turkey to a large serving dish and cover tightly with buttered foil, leave to rest in a warm place for 30 minutes. The reason for doing this is that resting the bird allows its juices to rise to the surface, making the turkey more juicy to eat and easier to carve. While the turkey is resting make the gravy, add enough flour to the roasting pan to take up the fat and drippings and make a roux. Add the wine to the pan and make sure to scrape up all the drippings all the flavour is in the bottom of the pan, transfer to a saucepan. Add about 500ml of the stock to the saucepan with the bouquet garni and bring to the boil, then simmer until the gravy is reduced you may need to add more stock if the liquid is too thick. Season to taste, remove the bouquet garni, and serve in a gravy boat along with the turkey. We like to serve the turkey on a dish surrounded by chipolata sausages wrapped in bacon and stuffing balls and sometimes a bread sauce and cranberry jelly. Using goose fat is the best way to get a crispy finish to both your Christmas bird and roast potatoes.